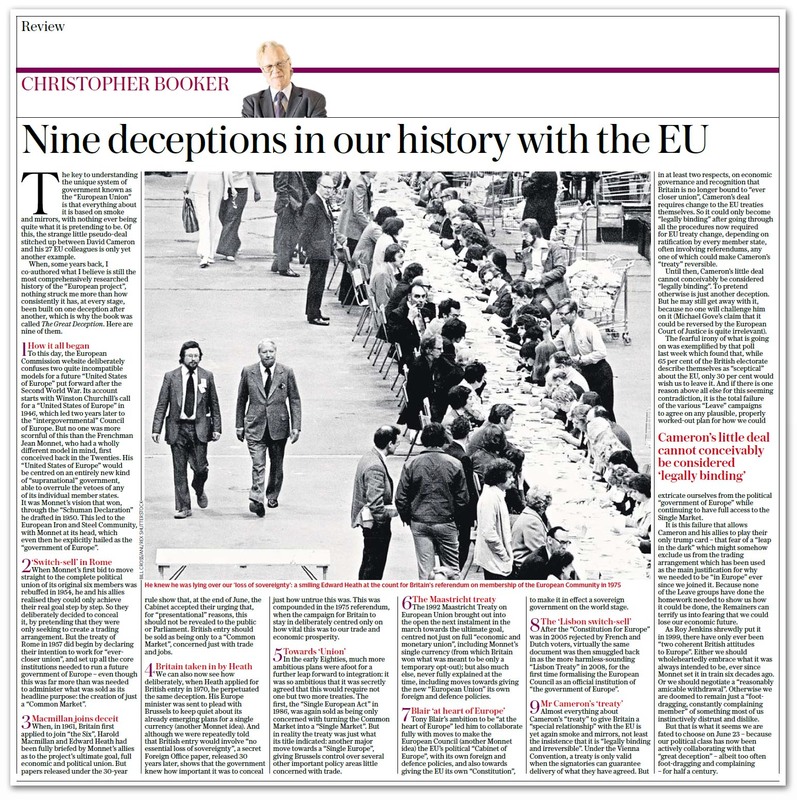 The key to understanding the unique system of government known as the "European Union", writes Booker, is that everything about it is based on smoke and mirrors. Nothing is ever being quite what it is pretending to be. Of this, the strange little pseudo-deal stitched up between David Cameron and his 27 EU colleagues is only yet another example. To this day, the European Commission website deliberately confuses two quite incompatible models for a future "United States of Europe" put forward after the Second World War. Its account starts with Winston Churchill's call for a "United States of Europe" in 1946, which led two years later to the "intergovernmental" Council of Europe. But no one was more scornful of this than the Frenchman Jean Monnet, who had a wholly different model in mind, first conceived back in the Twenties. His "United States of Europe" would be centred on an entirely new kind of "supranational" government, able to overrule the vetoes of any of its individual member states. It was Monnet's vision that won, through the "Schuman Declaration" he drafted in 1950. This led to the European Coal and Steel Community, with Monnet at its head, which even then he explicitly hailed as the "government of Europe". When Monnet's first bid to move straight to the complete political union of its original six members was rebuffed in 1954, he and his allies realised they could only achieve their real goal step by step. So they deliberately decided to conceal it, by pretending that they were only seeking to create a trading arrangement. But the treaty of Rome in 1957 did begin by declaring their intention to work for "ever-closer union", and set up all the core institutions needed to run a future government of Europe – even though this was far more than was needed to administer what was sold as its headline purpose: the creation of just a "Common Market". When, in 1961, Britain first applied to join "the Six", Harold Macmillan and Edward Heath had been fully briefed by Monnet's allies as to the project’s ultimate goal, full economic and political union. But papers released under the 30-year rule show that, at the end of June, the Cabinet accepted their urging that, for "presentational" reasons, this should not be revealed to the public or Parliament. British entry should be sold as being only to a "Common Market", concerned just with trade and jobs. We can also now see how deliberately, when Heath applied for British entry in 1970, he perpetuated the same deception. His Europe minister was sent to plead with Brussels to keep quiet about its already emerging plans for a single currency (another Monnet idea). .
And although we were repeatedly told that British entry would involve "no essential loss of sovereignty", a secret Foreign Office paper, released 30 years later, shows that the government knew how important it was to conceal just how untrue this was. This was compounded in the 1975 referendum, when the campaign for Britain to stay in deliberately centred only on how vital this was to our trade and economic prosperity. In the early Eighties, much more ambitious plans were afoot for a further leap forward to integration: it was so ambitious that it was secretly agreed that this would require not one but two more treaties. The first, the "Single European Act" in 1986, was again sold as being only concerned with turning the Common Market into a "Single Market". But in reality the treaty was just what its title indicated: another major move towards a "Single Europe", giving Brussels control over several other important policy areas little concerned with trade. The 1992 Maastricht Treaty on European Union brought out into the open the next instalment in the march towards the ultimate goal, centred not just on full "economic and monetary union", including Monnet's single currency (from which Britain won what was meant to be only a temporary opt-out); but also much else, never fully explained at the time, including moves towards giving the new "European Union" its own foreign and defence policies. 7. Blair "at heart of Europe"
Tony Blair’s ambition to be "at the heart of Europe" led him to collaborate fully with moves to make the European Council (another Monnet idea) the EU’s political "Cabinet of Europe", with its own foreign and defence policies, and also towards giving the EU its own "Constitution", to make it in effect a sovereign government on the world stage. After the "Constitution for Europe" was in 2005 rejected by French and Dutch voters, virtually the same document was then smuggled back in as the more harmless-sounding "Lisbon Treaty" in 2009, for the first time formalising the European Council as an official institution of "the government of Europe". Almost everything about Cameron's "treaty" to give Britain a "special relationship" with the EU is yet again smoke and mirrors, not least the insistence that it is "legally binding and irreversible". Under the Vienna Convention, a treaty is only valid when the signatories can guarantee delivery of what they have agreed. But in at least two respects, on economic governance and recognition that Britain is no longer bound to "ever closer union", Cameron's deal requires change to the EU treaties themselves. So it could only become "legally binding" after going through all the procedures now required for EU treaty change, depending on ratification by every member state, often involving referendums, any one of which could make Cameron's "treaty" reversible. Until then, Cameron's little deal cannot conceivably be considered "legally binding". To pretend otherwise is just another deception. But he may still get away with it, because no one will challenge him on it (Michael Gove's claim that it could be reversed by the European Court of Justice is quite irrelevant). The fearful irony of what is going on was exemplified by that poll last week which found that, while 65 percent of the British electorate describe themselves as "sceptical" about the EU, only 30 percent would wish us to leave it. And if there is one reason above all else for this seeming contradiction, it is the total failure of the various "Leave" campaigns to agree on any plausible, properly worked-out plan for how we could extricate ourselves from the political "government of Europe" while continuing to have full access to the Single Market. It is this failure that allows Cameron and his allies to play their only trump card – that fear of a "leap in the dark" which might somehow exclude us from the trading arrangement which has been used as the main justification for why we needed to be "in Europe" ever since we joined it. Because none of the Leave groups have done the homework needed to show us how it could be done, the Remainers can terrify us into fearing that we could lose our economic future. As Roy Jenkins shrewdly put it in 1999, there have only ever been "two coherent British attitudes to Europe". Either we should wholeheartedly embrace what it was always intended to be, ever since Monnet set it in train six decades ago. Or we should negotiate a "reasonably amicable withdrawal". Otherwise we are doomed to remain just a "foot-dragging, constantly complaining member" of something most of us instinctively distrust and dislike. But that is what it seems we are fated to choose on June 23 – because our political class has now been actively collaborating with that "great deception" – albeit too often foot-dragging and complaining – for half a century.